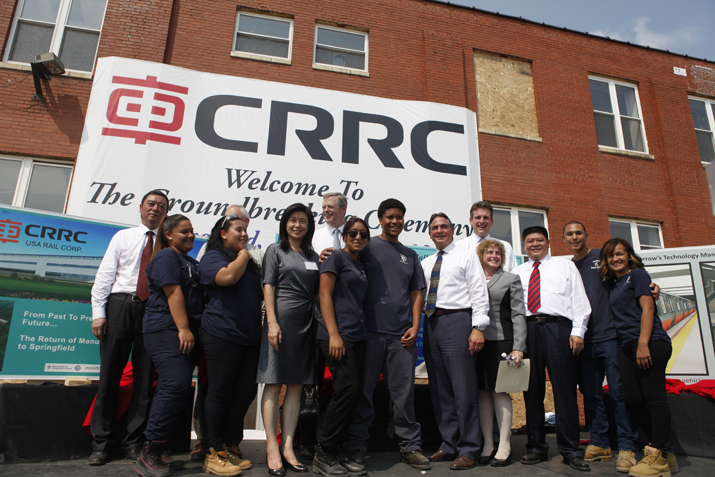 On September 3, China Railway Rolling Stock Corp. Ltd. (CRRC) USA Rail Corp. broke ground on a new, 220,000-square-foot facility valued at $95 million in Springfield, Massachusetts. This was the very first time that a Chinese train maker founded a production base on U.S. soil. Both the Chinese and the U.S. camps appear confident that this deal will have a successful outcome. They believe that it represents a good start for both sides to promote further collaboration in this field for the sake of facilitating reciprocal business interests and more job opportunities. In January 2014, strong blizzards hit Boston and its surrounding areas. Service on the long-established subway system of Boston ground to a halt, as some of the older subway cars that had seen 30 years of reliable service were incapable of coping with the harsh weather conditions. For the Massachusetts Bay Transportation Authority (MBTA), updating this vital commuter transit system was a pressing task, leading to a deal worth $566 million last October with the Chinese train maker CNR, which merged with domestic rival CSR in June to form CRRC. "It's our first project in the United States. And we must do it right," said Yu Weiping, Vice President of CRRC and the man in charge of the company's overseas operations, to Beijing Review . Under the terms of the contract, CRRC will manufacture 284 railcars for MBTA. Yu explained that his company has invested $95 million in building the new manufacturing facility in Springfield, so as to fulfill its promise that at least 60 percent of the supplies will be constructed in the United States. "We will strictly abide by our commitment to our U.S. partners," Yu stressed. Construction of the facility will commence in the spring of 2016, and is scheduled to finish before the fall of 2017. In the spring of 2018, production of railcars will begin in earnest at the new plant with the first batch expected in January 2019. All in all, the entire project will have wrapped up by 2022. "From supporting the local economy in Springfield and creating new manufacturing jobs to improving public transportation for Massachusetts commuters and visitors, this project brings with it extensive benefits across the Commonwealth," said Massachusetts Governor Charlie Baker, pointing out that the facility will deliver greater reliability and engender new opportunities for employment and economic development among the people of his state. Besides the investment, the facility will provide 150 stable job opportunities to local residents, with a minimum salary of $66,000 per year. MBTA General Manager Frank DePaola agreed with Baker. "It's a major investment in the future of public transportation in Greater Boston, as well as a sizeable investment in the Western Massachusetts regional economy," he noted. CRRC cherishes this project as a milestone of its own, said the Chinese side. "We are honored to have this opportunity to design and build railcars in Massachusetts," said Zhou Chuanhe, Chairman and President CRRC USA Rail Corp. He said the company appreciates the strong, unwavering support of its partners in Boston and Springfield. The new facility in Springfield will double as CRRC's U.S. headquarters as the company is optimistic in regards to additional business opportunities in the United States. "It's just the beginning," Yu said. "In recent years, China has made tremendous progress by introducing high-speed trains, which have brought a change to the lifestyle of ordinary people." He took example of a rising number of couples in long-distance relationships in China in recent years. "In times past, it was hard for long-distance couples to maintain closeness," Yu said. "With high-speed trains traveling at a speed of over 300 km (about 186 miles) per hour, time and distance between loved ones are much shortened. More and more young couples who live far from each other enjoy happy endings." Yu added that his company looks forward to contributing to a new high-speed rail culture in the United States. For the last few decades, Americans have become accustomed to commuting by automobile. However, rather than viewing this as a challenge, Yu said that he considered this as an opportunity for train manufacturers. By introducing high-speed trains, the average speed of the U.S. railway system can be increased by about 40 percent with greatly improved comfort and convenience, he predicted. CRRC makes a very convincing case for itself in terms of technical ability and overseas experience. According to Yu, the company's business income in the first half of 2015 reached 93.24 billion yuan ($14.62 billion), and its overseas income has seen an increase of nearly 61 percent on an annual basis. As CRRC seeks other opportunities in North America, it will surely face competition from foreign companies, such as Bombardier of Canada, Hyundai Rotem of South Korea, Kawasaki of Japan, Siemens of Germany and Alstom of France. Yu said he believes CRRC will be competitive owing to its efficiency, ability to keep costs low, flexible pricing strategies and, not least, sound track record overseas and in China. As of 2015, China is home to some 20,000 km (approximately 12,500 miles) of high-speed railway, and CRRC occupies 80 percent of the market for high-speed trains. Yu explained, "China has a vast territory with areas subject to differing geographic and climatic conditions. Our experiences at home and abroad have enabled us to provide first-class products and services." CRRC's U.S. arm also aims to open up new vistas for economic cooperation between China and the United States. Addressing a photo exhibition that attempts to encapsulate the history of Sino-U.S. railway cooperation, Zhang Qiyue, Consul General of China in New York, stressed, "The train of China-U.S. cooperation is on a high-speed track." Zhang said that economic ties between China and the United States are playing an increasingly important role in the two countries' overall relationship. "Although China's annual GDP growth has slowed to around 7 percent, its contribution to the world's economy is still large," she noted. Yu pointed out that the history of Sino-U.S. railway cooperation stretches back over 150 years. "Today, the cooperation has entered a new phase," he said. According to him, in line with CRRC's ambitious development plan in United States, the company will not only provide upgraded railway system to Americans, but also tens of thousands of job opportunities to them every year. CRRC Corp. Ltd. (CRRC) was formed when CNR Corp. Ltd. and CSR Corp. Ltd. decided to join forces on the basis of the principle of reciprocity. The company officially came into existence on June 1, 2015. At present, it has 46 wholly owned or holding subsidiaries and more than 170,000 staff. Its head office is located in Beijing. Having inherited the whole business and assets of CNR and CSR, CRRC is the largest railway transportation equipment supplier in the world with the most complete range of products in addition to cutting-edge technology. High-speed electrical multiple units (EMUs) and self-propelled carriages have become the company's calling card, epitomizing China's developmental achievements for the rest of the world. Its entire suite of products have been exported to nearly 100 countries and regions across six continents. It is attempting to gradually switch focus form product export to technology and capital export as well as global business. Following development strategies of internationalization, diversification and collaboration, CRRC aims to turn itself into a global leader and system solutions provider in the high-end railway transportation equipment market. Bilateral cooperation in railways between the United States and China started in the 1860s, when what was the first railway traversing North America and the world's first transcontinental railway, the aptly titled First Transcontinental Railroad, was under construction. From 1865 onward, more than 12,000 Chinese workers traveled to the United States to build the Pacific section of the railway. The completed railroad measured more than 1,700 miles, and 95 percent of its western section was completed by Chinese workers. In the 1870s, 120 Chinese students with a median age of only 12 were dispatched by the government to study in the United States. Of them, Jeme Tien-yow (1861-1919) is perhaps the best known. After finishing studying railroad engineering at Yale University, he applied his knowledge to railway construction in China. He has been honored as the "father of China's railway" and the "father of modern Chinese engineering." In modern China, many railway engineering experts initially studied in the United States, such as Mao Yisheng (1896-1989), who presided over the construction of the country's first road-rail bridge--Qiantang River Bridge--in Hangzhou, Zhejiang Province. Sino-U.S. collaboration in railway continues to this very day. Apart from importing complete locomotives, China has carried out extensive technological cooperation with relevant U.S. companies and introduced American high-end rolling stock technology.